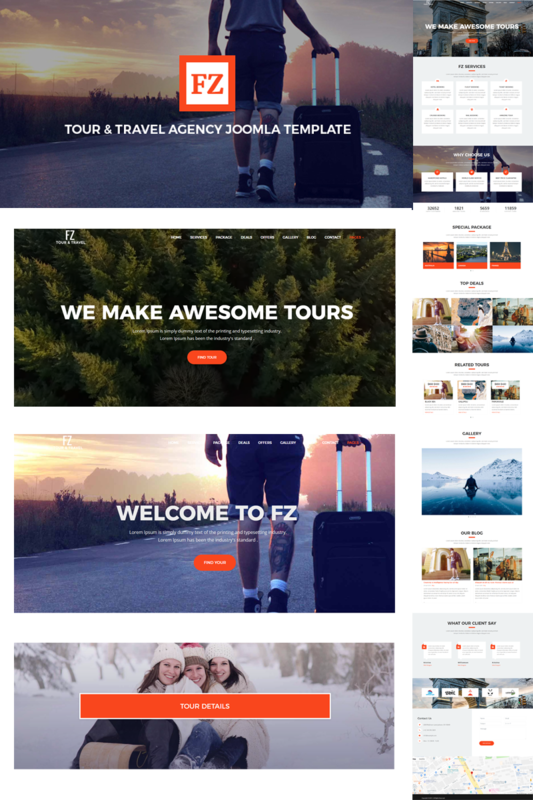 FZ – Tour & Travel Agency Template suitable for travel agencies, adventure parks, tourism and tour companies. It is 100% responsive and looks stunning on all types of screens and devices. Well organized and very easy to customize. FZTour is better way to present your modern business. FZtour is based on Helix Ultimate framework, Made with Sp Page builder Pro, Layer Slider. Not only will you save heaps but you also get to extend the functionality with Joomla! with some of the heaviest hitting plugins, but they are all included in the one off purchase price of FZtour. SP Page Builder version Trusted by over 400,000 people across the world, with SP Page Builder you'll be creating killer pages with the ease of drag & drop. With a completely visual way of building pages, SP Page Builder is fast, easy to use and best of all happens in true time so you can be sure of your changes before committing them to the live site. Layer Slider: With pre made sliders, Layer Slideshow will bring a really unique look to your website build. Create stunning artistry with limited design knowledge – load your own images using the Joomla Media Manager, edit some text and you are done!